My mission through writing this article is to broaden the horizons of your imagination while customizing Swarovski Crystal bouquets and boutonnieres. Many people may not know exactly how versatile these arrangements can be. The sky is the limit when designing in this medium. So I am going to offer several ideas that will get your mind working to create beautiful arrangements that will match not only your color scheme, but also your personality on your wedding day. Swarovski Crystals come in endless shapes, sizes and colors. You can combine all of these in many different ways to create bouquets and boutonnieres that reflect your taste and style. Combining Swarovski Crystals that are all the same color and the same shape but vary in size is very dramatic. You may choose to have the sizes distributed randomly throughout the arrangement or you could create a pattern with the larger crystals in the center and fading to smaller crystals on the outer edges. Or maybe try the smaller crystals in the center where they are a bit more abundant, with the larger ones on the outside. Since crystals are significantly heavier when you get to ten millimeters and above, it is nice to have them mounted on wires that are a little bit longer because this will create a lot of movement in your bouquet. Remember, the more a crystal moves, the more chances it has to catch light and sparkle incredibly bright. Another option is to choose crystals that coordinate with your color scheme. For example, your bridesmaids and groomsmen are wearing a pale shade of blue. It is stunning to choose five or six shades of blue crystals in dark to light hues and combine them all together to create your bouquets and boutonnieres. This makes it very easy to compliment any accents that you will have on your day. Whether you are working with other fabrics, flowers, or jewelry, you don’t have to worry with matching the bouquets and boutonnieres perfectly to one item since there is such a great variation in tones. Adding Swarovski Crystals to a traditional wedding bouquet or boutonniere is a very effective way to have crystal accents and stick to a more traditional theme. You can have the arrangements dominated by crystals or you may want to have the flowers take over and have the crystals add merely a hint of glitz and glamor. While speaking with a bride recently at a wedding show, she told me that she would like to have a theme of rubies for her Valentines Day wedding. I suggested that she create a bouquet and boutonniere that have ruby red crystals in the center in the shape of a heart and have clear crystals surrounding them. She could have the entire bouquet arranged in the shape of a heart, a butterfly, a star, or even a grapevine. I hope that I have helped you in opening the doors to the endless possibilities that are given to you when you choose Swarovski Crystal Bouquets and boutonnieres. For more ideas on creating Swarovski Crystal bouquets and boutonnieres visit Brilliant Wedding Jewelry to see a number of samples. Spice up your bouquets yourself by using Swarovski Crystal Stems. 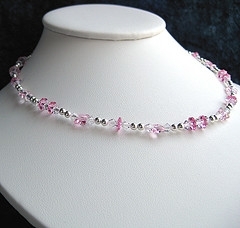 This entry was posted in Crystal Glitz and tagged butterfly, crystal, dangle, jewelry, swarovski on July 14, 2009 by admin.